In addition to farm things April is also Mom’s Weekend at Washington State University as well as my birthday. A big month for me and I’m so thankful for all the support I have at home. It appears I am only getting one Teeswater this year. The breeder had more boys than girls and out of the two ewe lambs she feels only one appropriate for a breeding program. While I am bummed, I appreciate her good character. It is important with any animal to only reproduce from the cream of the crop, but with rare breeds its crucial to not use anything but the best. The goal is to constantly improve the local genetics and for that, standards should be high. So I am getting one FABULOUS little girl later this week. Meanwhile back at the ranch, our girls are percolating along very nicely. Everyone appears healthy and happy, and quite round. Tom made our first lambing jug. 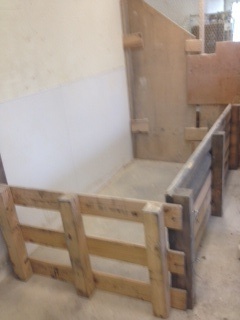 The inside pen where our sheep will have their babies. Each ewe will occupy the space for just a few days. We have room to build more but it looks like the due dates will be staggered just enough to only have one in labor and delivery at a time. Once delivered the lambs and mom will spend a couple night alone together to get to know each other and to ensure all is at it should be. Today is the last day of Mom’s Weekend at WSU. It’s been awesome to spend time with my daughter and meet her friends. I even sat in on a chemistry lecture. It was the first time attending a real college lecture, thank goodness for good coffee and my iPad. I did understand a little of what was said (the math bits) and I set a new high score on the game my daughter introduced me to. All in all, an hour well spent. In between new games, new friends, and midnight strolls through Greek Row, I have coordinated most of the final details of shipping the Teeswater. It seems the crate I originally ordered wasn’t going to be big enough, so an emergency order for a replacement was made. Also, the feed she has been on isn’t available in Alaska so I’m having a bag sent with her to ensure that I have plenty of time to switch her over to local feed without upsetting her system. This week Al has shown a huge interest in chicken welfare. Chickens have always been one of those things that were tolerated and pretty much ignored. The Maremmas spend all day every day in and around the barn, co-habitating with chickens and turkeys for their entire lives without really paying any attention at all, except to keep the would-be predators at bay. The flocks ebb and flow with the seasons and production. Too many roosters or hens past the point of lay, and a handful find their way to Camp Kenmore. Spring is in the air and the incubator gets fired up and new chicks hatch like popcorn. I hatch many and keep a few, chick sales help to offset the feed bills. Chicks that I keep are housed in the garage for 3 or 4weeks, until they can keep themselves warm. Then they are moved to the barn, into the wooden cage called a brooder, where they are safe from the bigger birds while they adjust to barn life. When they outgrow the brooder they get moved in with the layer flock and have access to the outdoors via the automatic pop-door. The chicks in question were hatched around the first of the year. Three little black chickens, teenagers in chicken years, full of vim and vigor but not enough smarts to come inside at night. 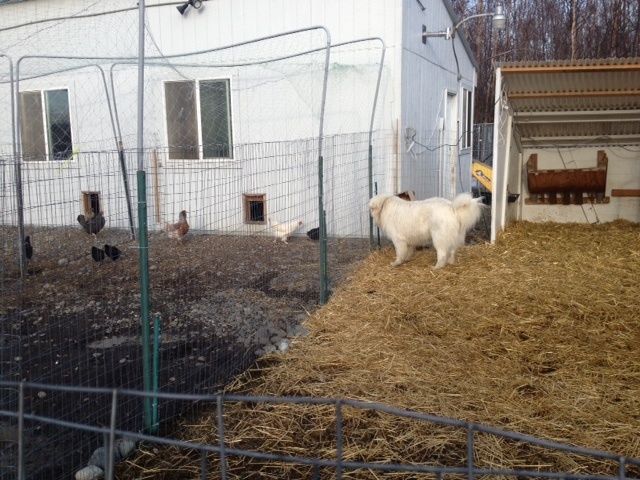 Poor Al couldn’t get into the chicken run but wanted to be sure we knew these youngsters were staying out all night. Fussy and whining, he led Tom to the fence so the little buggers could be put inside. Saddly, the littles kept staying out all night and two perished. Al was beside himself, unable to get to them. The lone survivor has been demoted back to the brooder for another week or so and will be reintroduced to the flock with some smarter siblings. Today will be movies and chillin’ in the dorms. Tomorrow is travel day, home again, home again… Friday the baby Tees flies to Alaska. Saturday is my birthday. Sunday is Easter. And somewhere, in all of that, the first lambs will be born at Tower Ranch.